Cozy and spacious 1/1.5 with water view & split floor plan and over 1000 sq ft of space. Plenty of closet space and tile throughout home. Carpet in Master. Private Balcony over looks the gorgeous Bay. 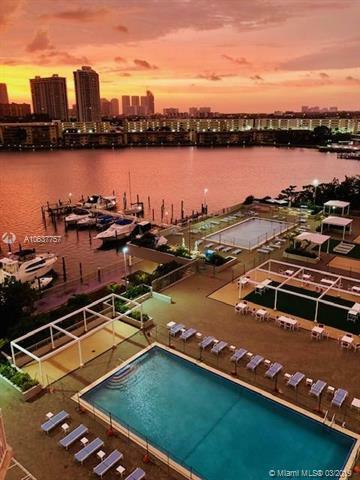 Building amenities include: BBQ area, 2 swimming pools, tennis, full-service restaurant and coffee shop, hair and nail salon, fitness center, party room and private marina. Maint. Fee inc. extended cable service package, water and TOTAL. This building is perfectly located in the heart of Aventura. Tenant can walk to all shops including Fresh Market Plaza, Starbucks, Panera, Olive Garden, Anthony's Coal Fired Pizza, Rendezvous French Bakery, Burger-Fi, Smoothie King, Office Depot, etc. Minutes from Sunny Isles Beach, Aventura Mall, I-95, Airport(s) and all major shopping centers and schools.